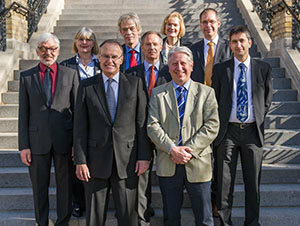 Heidelberg’s Rector Bernhard Eitel and Nicholas Entrikin, Notre Dame’s vice president and associate provost for internationalization, signed the memorandum. Notre Dame will be the first American partner of Heidelberg University. The institutions will be exploring areas such as joint meetings and conferences; academic exchanges involving undergraduates, graduate students, professional students and faculty; and joint research activities. Founded in 1386, Heidelberg University, a state university of Baden-Württemberg, is Germany’s oldest university. In addition to strong programs in the humanities, Heidelberg has many notable strengths, especially in the natural sciences. It has a leading medical school, and its German Cancer Research Center is one of the world’s leaders in the field. Originally published by William G. Gilroy at news.nd.edu on June 16, 2014.